SUNSET OVER STRANGEWAYS PRISON - not the most romantic of settings, and yet due to the shape of the tower, this could almost be one of my photographs from the Middle East of the sun setting next to a mosque. Sunny skies and high temperatures arrived in Manchester in time for the weekend starting Friday 16 June 2000. Things clouded over late afternon, but by nightfall, all the clouds had gone, leaving the sky clear for a superb sunset. I was just passing through the city centre and took this photo from just above St Michael's Flags, off Rochdale road. I wonder what the inmates of HMP Manchester must think, as they look out the window at this sky. THE SOUTH MANCHESTER LOOP LINE is seen here from Lindley Wood Road bridge, looking west towards Ladybarn Lane and the former Fallowfield Station, now the site of a Sainsbury's supermarket. This line was opened in 1892 and was closed to passengers in 1958. It remained in freight use for another thirty years. I'd love to see an old picture of this view with a steam train on its way to the next station, Levenshulme. Have you got one? DIDSBURY BY NIGHT is a lively place at the weekend. On Thursday night, it's a bit quieter, as we can see here. This Stagecoach 42 bus is on its way from Manchester city centre to Stockport. The journey from Piccadilly will have taken about 25 minutes. Under the 'big bang' expansion plan, drawn up in 2000, the old Didsbury railway line will be reinstated for use by Metrolink, so you'll be able to get last orders in Didsbury and be in a city centre night club within 20 minutes, without having to take a taxi. A PINK SKY OVER RADCLIFFE (Lancashire/Metropolitan Borough of Bury) was seen on the evening of Wednesday 14 June 2000, after a cloudy day. The parish church stands on the hillside, silhouetted against the dusk sky. On the upper right is the district of Black Lane. Just visible in the lower left is the Alisha restaurant. 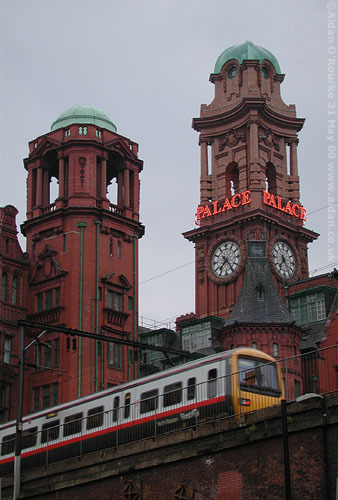 Manchester city centre is about six miles (10km) south east of Radcliffe and easily accessible via the Metrolink. RYDER BROW STATION, in the Manchester suburb of Gorton, is on the line from Manchester Piccadilly to Romiley, Marple and New Mills. The left hand train is bound for Manchester Piccadilly. The other is an express on its way to New Mill Central. In the distance can be seen the CIS building, in Manchester city centre, three and a half miles (6km) away. THIS IS THE A6 which runs south east through Manchester to Stockport, Hazel Grove and beyond. The Manchester Piccadilly to London (West Coast) railway line crosses over Stockport Road here in Longsight. This concrete bridge dates from around 1960, when the line was electrified. A Magic Bus 192 bus is on its way from Piccadilly to Stepping Hill hospital, in the south of Stockport. The A6 is one of the most congested routes in the conurbation. In 2000, a 'quality bus corridor' is planned for this stretch of the road, making bus journeys quicker but slowing down other traffic even more. MYSTERY LOCATION - Do you recognise this spot, not far from Manchester city centre - it's a path leading up to a footbridge over some railway sidings, now disused. 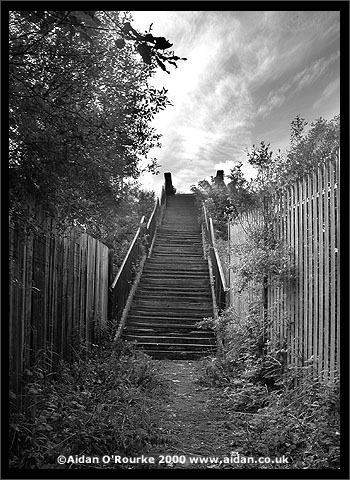 The steps are delapidated but the pathway is still open to the public. Just up those steps was once a view over railway lines, steam engines, sheds, turntables, water tanks and coal trucks - nowadays all you'll see is a flat grassy expanse where the tracks used to be, and a car park. THIS IS THE VIADUCT from Piccadilly (formerly London Road) to Oxford Road on the evening of a drizzly 31st of May 2000. A train is just about to arrive at Oxford Road station. Behind it, the smaller and larger towers of the Palace Hotel, formerly the Refuge Assurance Building (opened c 1905), loom up against a grey Manchester sky. We are standing on Charles Street, next to the BBC. A quintessentially Manchester scene which has changed little in a century - only the hotel sign, the overhead gantries and of course the train are modern. The cast iron reinforcements on the viaduct, by the way, are original and can be seen in old photographs. R.I.P. 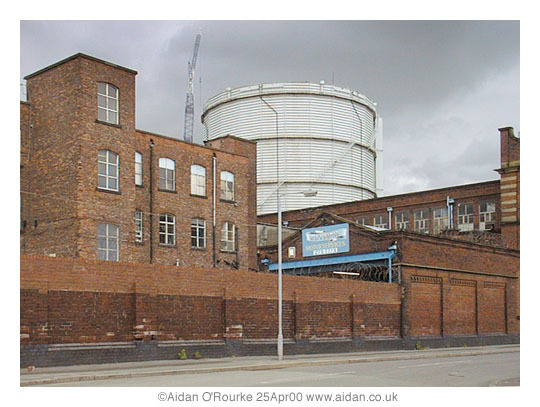 THE BRADFORD GASHOLDER which is about to disappear behind these factory buildings on Upper Helena Street. The picture on the right shows how it looked on 25 April just after dismantling commenced. I took the picture on the left at about 9.15pm 31 May 2000 and uploaded it later that evening. 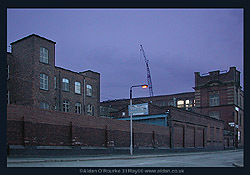 This area preserves the look of the old Manchester, a Manchester which has already disappeared to a large exent, and will continue to disappear, as redevelopment goes on.